Flint residents rode buses overnight to tell Congress about how the water crisis has upended their lives. Their governor was conspicuously absent. Until a month or two ago, Tammy Brewer didn’t really understand what lead poisoning was. The lifelong Flint, Michigan, resident doesn’t have a TV, and because of health issues she doesn’t spend a lot of time out and about in the city. She was “cut off,” as she puts it, and besides, she had other things to worry about: In the past few years her mother died, she separated from her husband, and then she lost her son, too, from complications related to diabetes. It wasn’t until friends told her there was something wrong that she made the connection between the switch the city made in the source of its water supply in April 2014, and her thinning hair and the painful sores she’d been getting all over her body. “I just can’t even fathom all that’s going on, and then—we’re being poisoned by our own government?” Brewer says. She worries that her niece and nephew, who lived with her for most of 2014, were exposed to lead. “I was still cooking with [tap water.] I didn’t know,” she explains. Now Brewer uses bottled water, but only when she can afford it. With an income of $630 a month, plus $80 in food assistance, there’s not a lot left over for the extra expense. On Tuesday evening, Brewer and about 60 other Flint residents boarded busses bound for Washington, DC. 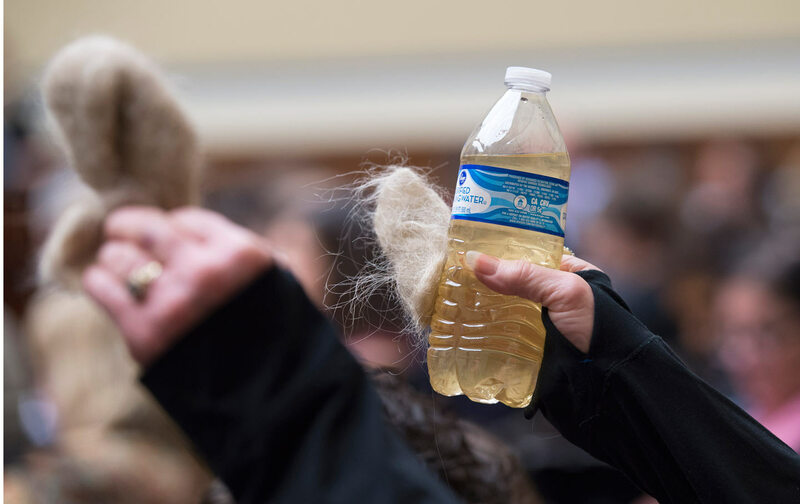 They arrived Wednesday morning just as the House Committee on Oversight and Government Reform began a hearing “to examine the ongoing situation in Flint.” There were two conspicuous absences on the witness panel: Michigan governor Rick Snyder, and Darnell Earley, the Snyder-appointed emergency manager who approved the switch to corrosive water from the Flint River in 2014. Earley had been served a subpoena issued by the committee’s Republican majority, which he defied. Snyder wasn’t even invited to appear—an oversight that rankled Democrats on the committee, as well as Flint residents like Brewer who’d made the trip themselves. “We are missing the most critical witness of all: the governor of the State of Michigan,” said an emotional Elijah Cummings, the ranking member on the committee. “Can anybody tell me why the governor of Michigan is not here today? Because he’s hiding,” said Pennsylvania’s Matt Cartwright, who said the hearing was designed to “create an equivalency of blame,” rather than determine real responsibility. In a letter sent the same day to committee chairman Jason Chaffetz, Cummings and Democratic colleagues accused him of trying “to limit our Committee’s investigation to the actions of the federal government.” Although an official from the Michigan Department of Environmental Quality was grilled at the hearing, it was clear that the main target for Republican members was the Environmental Protection Agency. Witnesses and representatives tossed around blame like a rotten hot potato. When MDEQ director Keith Creagh tried to pin the crisis on the city’s failure to treat the water with corrosion controls, rather than the decision to switch water sources, Cummings pounced. “Why would Governor Snyder try to blame the City Council for this decision when it was his own appointee who made it and you have a City Council that has no authority?” he asked. The failure to implement a legally required corrosion control plan certainly contributed to the crisis, testified Marc Edwards, the Virginia Tech water expert whose Freedom of Information Act requests exposed how Michigan state officials tried to hide evidence of lead contamination—but so did failures of the EPA. “I think EPA casts a blind eye on these municipalities which are not following [the federal Lead and Copper rule],” he said. “The only thing I can conclude is that they don’t care.” Dan Kildee, who represents Flint, testified that although he agrees the EPA acted too slowly, Michigan officials blaming the EPA is like a bank robber blaming the police for failing to stop them from getting into the bank. The Flint residents who’d traveled to Washington were quite clear about who they want to testify under oath: Governor Snyder. “Snyder still refuses to talk to us. I want to ask him face to face: Why’d you do this to my kids?” Melissa Mays, a Flint resident who says her sons have weakened bones and other indicators of lead poisoning, said at a press conference following the hearing. The Reverend Charles Williams II, president of the Michigan chapter of the National Action Network, called on Congress to subpoena the governor. “Congress needs to call on Governor Snyder to answer to this crime,” he said, to shouts of assent from the room. Another Flint resident, Lorenzo Lee Avery Jr., called for Snyder’s arrest. “We’ve been poisoned by politics,” he said. Stephanie Davis, who has lived in Flint her whole life, told me that what frustrated her about the committee’s hearing was that hardly anyone talked about what should be done to help Flint now. Besides answers from Snyder and accountability for officials, Flint residents want their pipes fixed. “It’s…important for us to understand that even in the minute that we have right now, people in Flint still don’t have access to clean water,” Williams said. “We need shovels in the ground today.” He called on Congress to pass a bill proposed by Michigan senators last week that would funnel $600 million in emergency funds to Flint, $400 million of which would go to replace the city’s lead-contaminated water infrastructure. That’s about half of what the state estimates it would cost. While Republicans have been eager to blame the federal EPA for the crisis, many say the cost of fixing the problem is a state and local responsibility, and it’s far from clear they’ll let the funding package move forward.